As Jordan and BAR started testing with the new engine, Honda was dismayed by the apparent lack of pace being shown. These days, it is relatively common for new cars to be slower than the old model � particularly with the FIA working hard to slow them down. 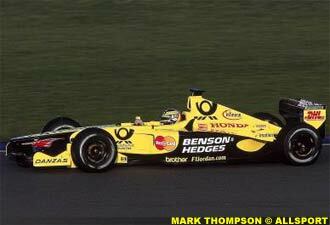 What made Honda concerned however was that the cars came out of the box three seconds slower than the hybrid cars � the 2000 model, with 2001 aerodynamics. It's only natural to expect a car designed specifically for the rules to be quicker than the old model. That wasn't all. The results were not entirely down to the chassis being slow. Trials in the hybrid cars showed that the new engine was not attaining the same results expected from the design or the dyno � changes to balance and mounting made a difference to the effectiveness of the unit. BAR struggled for a while with fuel supply issues � unexpected, as the system worked fine with last year's engine � whilst no-one is prepared to talk about the Jordan gearbox. It's known there has been an issue with it leaking oil, but why it leaked, and how major the work to resolve it proved, has not been discussed. Despite their concerns, Honda have been getting on with their role � developing the engine. A thoroughly professional outfit, concerns notwithstanding, they responded to the requests from the teams for more from the engine. Reliability was imperfect at the outset, but the issues were quickly resolved. Power was good in places, notably the peak of revs, but delivery was not as smooth as either team expected of Honda � or on as wide a curve. Working to provide solutions to the problems of two teams was always going to be an interesting assignment, so the development team made life as easy for themselves as possible. This is why the engine was made available for testing as far back as December. Even whilst the first units were being assessed, and being run to put the miles on, it was full steam ahead back in the workshops. Between improvements in the design, and work on engine mappings, the latest evolution is a work of art � and reliable to boot. As the competition have largely struggled to run race distances, Honda's attitude has changed. Both BAR and Jordan are continuing to gain in pace, and each is rapidly resolving their reliability difficulties. As they do so, Mercedes and BMW � who alongside Ferrari provide the only engines that worry Honda for the coming year � are struggling. So, given four units in each race, Honda sees the chance of good points at every event. Over the coming year, it seems BMW-Williams are looking like a dark horse, particularly with the unknown of running on Michelin tyres. But for now, there is a strong smell of opportunity in the air, and Honda are looking forward to capitalising. McLaren saw Ferrari win both Championships last year, despite running a car that was arguably not as fast as their own. Identifying how this was possible has not proven difficult: the media has been shouting it for a full season. Superior reliability and strategy have been leveraged to maximum effect. 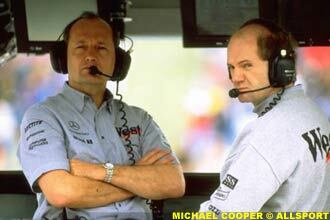 Oddly, McLaren do not place reliability at the top of their hitlist � and 2000 shows why. Ferrari failed to finish eight times, to McLaren's six, from 34 starts. So, just being more reliable than the bulletproof Ferrari is not enough. The emphasis remains firmly fixed on speed, and the new challenger is indeed quick. That said, complacency is not a McLaren trait. Work on reliability is running full steam ahead, particularly on ironing out the problems with the Mercedes engine, which is only doing race distances about half the time. There is a good chance of seeing a few all McLaren front rows at the start of the season, but without sorting reliability, points are going to be scarce. Recognising that staying in front is about strategy as much as speed and reliability was brought home last year. Thinking "outside the box" has been a key discussion point over winter. Dominating from the front requires the ability to build an unassailable lead, which is difficult against a charging Schumacher. Second guessing the Ferrari gang and reacting to their on-track movements is vital. Key to dealing with the strategy issue is communication. The drivers need to hear when they are called in � something which often happens right at the last moment, when reacting to other cars � and all the key decision makers need to be able to communicate clearly, and without the need to repeat themselves. To this end, McLaren have been spending a lot of effort on developing new communications systems with Kenwood. In 1999, the revolution was the introduction of "proper" encrypted radio links: the scrambled, channel hopping signals stopped eavesdropping, and reduced interference from competing local radios. Preventing other teams from overhearing plans was a good start, but quality of sound is important too. A driver's helmet cuts out a lot of the engine and wind noise, but their voice is still competing against the background. Similarly, the engineers are suddenly unintelligible against the noise of cars coming past in the pits. The new technology is very impressive. It is based on a concept which has been around for a long time � you can get sound systems for cars which take out noise from the engine and road, by generating an "inverse signal." It works by monitoring the sounds in the car, and calculating a sound to feed back into the car to cancel out the noise. Making ear-pieces to perform the same task is a challenge. When the system works properly, it can be used to regulate the total volume at the driver's ear � and with hearing loss an occupational hazard, that is certainly welcome. Furthermore, the ear-piece can reduce noise during pit to car conversation. As a bonus, it can filter out all background noise in the car-to-pits direction, providing a clean signal to the engineers. Similar technology works for the pit headsets. There was some talk of using ear-pieces inside the headsets, which would be able to pick up the wearer's voice by analysing the sound coming from the ear canal. However, with rumours of teams employing lip-readers, maintaining the microphone in front of the mouth is favoured. Existing systems are capable of working in hostile environments � similar projects are on trial with the military in several countries � so Formula One should be a relative picnic. The question is, as the technology disseminates through the paddock, where will teams put the blame for missed pit calls in the future?